Lizmarie Maldonado is a biostatistician for The John P. Hussman Institute for Human Genomics at the University of Miami (UM) conducting genetic research for Parkinson’s disease. Prior to joining UM, she worked as an epidemiologist at the local health department in Miami-Dade. She holds a Master of Science in Public Health degree, specializing in biostatistics from the University of South Florida. These are articles that Lizmarie has reviewed. Meperidine is a pain reliever used to treat moderate-to-severe pain. If you or a loved one is addicted, call us to learn more about recovery options. Learn about symptoms of Lortab overdose including blue-tinted skin and fatigue, and what the best options are to get addiction treatment. Are you or a loved one looking for resources on Ketamine recovery programs? 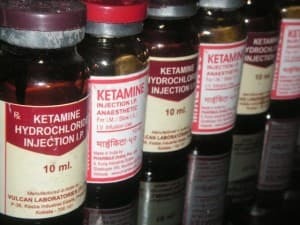 Find resources and treatment programs for Ketamine addiction here. Marisa Crane, B.S., is a Web Content Writer at Recovery Brands. Before Recovery Brands, she worked as a Behavioral Health Worker for urban youth in the school setting and as a Mental Health Worker for adolescents in a partial hospitalization program, where she worked closely with therapists to implement individualized treatment plans and prevention programs, as well as intervening when problematic behaviors arose. Marisa has a bachelor’s degree in Health Sciences and a minor in Psychology from Drexel University and is currently pursuing her master’s degree in Social Work from Widener University. Kaitlyn Motley is the Mental Health and Substance Use Services Director at the Texas Council for Community Centers. She has an M.P.A. in Social Policy Management and an M.A. in Clinical Psychology. Her professional experience has been in mental health and substance use policy management, implementation and oversight. Kaitlyn recently worked as Public Health Advisor and Project Officer at the Substance Abuse and Mental Health Services Administration (SAMHSA) and as a Social Science Analyst at the U.S. Department of Health and Human Services.